3rd District Councilwoman Jannie Blackwell introduced a bill in City Council on Friday that would double mandatory minimum parking requirements for apartment buildings--a regressive policy change that would hike rents on low-income and middle-class renters across the city. Minimum parking requirements regulate the number of parking spaces a developer is required to build for each dwelling of a building. They may seem like a freebie, but they're really anything but. Some imagine that developers will shoulder the cost of these parking mandates, but in reality, those costs are passed straight through to tenants as higher rents. Because not everyone chooses to own a car, the effect is to force lower-income renters to subsidize their wealthier neighbors' parking through their rent. They also encourage more driving and traffic congestion, and make neighborhoods more spread-out and less walkable. In the 2012 zoning reform bill, City Council voted to remove parking minimums for single-family homes, commercial buildings, adaptive reuse and preservation projects, and small apartment buildings with fewer than four units. The only parking minimums that remain in the zoning code are for mid-rise and high-rise multi-family mixed-use buildings. For these types of buildings, parking is required at a ratio of 3 spaces for every 10 dwellings, though the first four dwellings don't count. Prior to 2012, parking minimums would be triggered for any change of use, making it difficult and expensive to reuse historic buildings. Parking requirements for single-family homes encouraged front-loading garages that harm the urban streetscape, and effectively privatize formerly shared curb parking spaces. Removing parking minimums for most building types was an incredibly important win for housing affordability, and easily one of the most important progressive policy changes in the zoning reform package, but unfortunately some Councilmembers never did understand why they voted for this, and have been trying to reverse course ever since. Sadly, Blackwell's bill is only the latest example. Council started trying to tinker with this right after the code changes passed. And then just this past April, Council President Darrell Clarke again questioned why parking minimums were reduced in 2012. 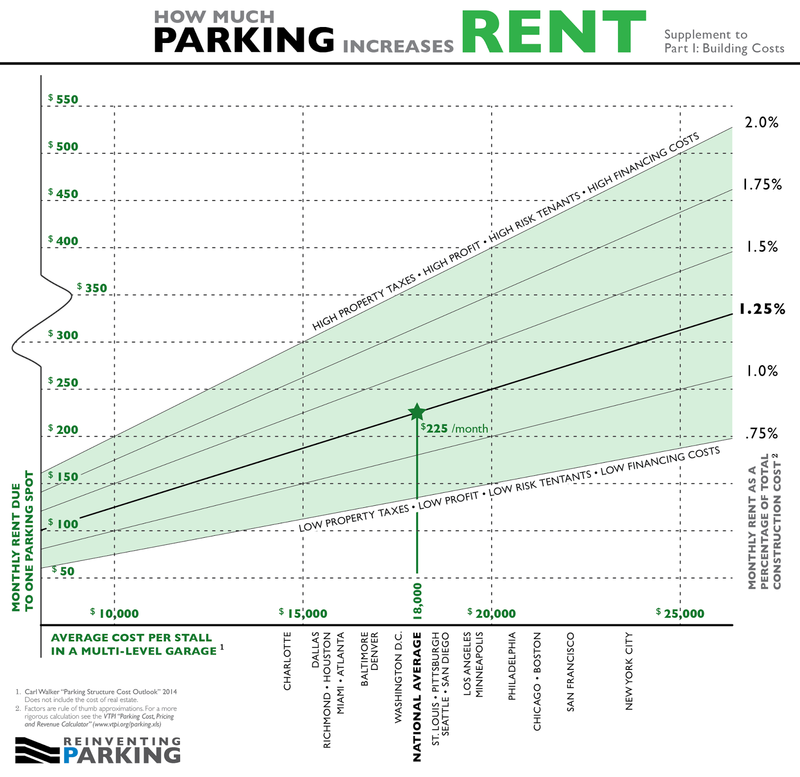 As a refresher for those who still don't get it, the reason we reduced parking minimums was to reduce the cost of living for people who either don't want, need, or just can't afford a personal vehicle. Contra Darrell Clarke, about a third of Philadelphians don't own cars, and don't drive to the corner store, so it's unfair to make them pay extra rent to subsidize their neighbors' parking. Between construction costs, land value, and amenity value, parking spaces increase housing prices more than you might expect. Last year, the parking researchers at Reinventing Parking looked at market data from large U.S. cities and found that, on average, a single parking space adds between $150 and $400 per month to rents in Philadelphia. It's hypocritical for City Councilmembers who claim to be concerned about housing affordability to support policies like minimum parking requirements, which needlessly increase housing costs, especially for renters. According to an Econsult analysis of Census data, car-owning households in Philly are generally richer, whiter, and more likely to be homeowners, while non-car households are poorer, less white, and more likely to rent. The green chart on the left gives the citywide breakdown, and the blue chart on the right is Center City only. People who live in multi-family buildings are also much less likely than single-family homeowners to have a car. If anything, Council should build on the progress they made during the 2012 zoning reforms, and clear the last remaining parking mandates out of the zoning code. With the stroke of a pen, they could meaningfully lower the cost of living for low-income renters all over the city, and create more inexpensive housing choices for thousands of Philadelphians. It’s not entirely right to equate Council hypocriticalness with a bill designed to address exactly what 90% of constituents want. With unlimited terms, their mission is solely to respond to constituent demands to the letter in order to get reelected. Following even the most basic Greenworks sustainability goals or meeting affordable housing goals doesn’t help them in that respect, because the macro-level, long-term improvements associated with lowering parking requirements doesn’t translate into anything the prime voting block really wants. I believe that in order to truly address the obsession with parking, urbanists must examine the basis on why so many alt-transport-rich and poorer communities defend parking, and stress directly to those communities why improved alternatives would meet their transport needs a lot better. I don’t believe that most long-term residents overwhelmingly choose driving out of personal preference; rather the lack of acceptable alternatives to distant job centers is what drives them towards this demand. So instead of rolling the dice and trying to withdraw this bill outright, we could get Blackwell to propose a “transit-minimum” bill that would mandate developer subsidy of transit passes or sponsorship of bike share stations, possibly even tied to a further reduction of existing parking minima. Improvement of SEPTA connecting bus service, and transitization of Regional Rail would be the real solution though, and that can’t be addressed in any way other than for Council to explicitly address this in City Hall, and Planning to make this a priority. Both have been shamefully and unbelievably negligent in this regard.